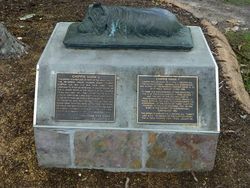 Effigy of Chippie Mark IV who was the canine companion of Tubby Clayton founder of Toc H.
The sculpture is a memorial to Tubby Clayton who was born in Maryborough and commemorates the anniversary of the death of Tubby Clayton in 1972. It also marks the anniversaries of the granting to Toc H of the Royal Charter by King George V and the Central Lamp of Maintenance from Prince Edward both in 1922. 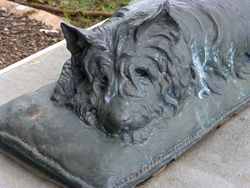 Chippie Mark IV was one of a long line of Cairn Terriers given to Tubby Clayton by, first of all Queen Mary and later by Queen Elizabeth, the Queen Mother. Everywhere that Tubby went Chippie went also - the two were inseparable, and it is fitting and most appropriate that the effigy of Tubby in All Hallows in London includes the effigy of Chippie sitting at his feet. Toc H was discovered and nurtured by Tubby in the Chapel, the "Upper Room", in Talbot House in Poperinghe, Belgium Poperinghe just 11 kilometres west of Ypres. In December 1915 Queensland born Army Chaplain, the Reverend P.B. (Tubby) Clayton opened a Soldiers Club here and right from the beginning it had a remarkable atmosphere during the darkest days of World War One. Through the horrors of war an ideal was born, a lofty ideal and it found expression in a world wide movement called simply Toc H, the Army signallers code word for Talbot House. From 1925 to the outbreak of World War Two Toc H spread rapidly to all Australian States and its members built a fine tradition of `Caring for People` carrying on the ideals for which Talbot House stood. They pioneered the Blood Transfusion Service, the Junior Farmers Movement, the Royal Queensland Bush Children`s Health Scheme and the Camping Program for children in need or with disabilities.Toc H is all about Spirit, a Utopia of Spirit, and it was this kind of Utopia to which Tubby Clayton devoted his life`s work. CHAPLAIN TO FOUR SOVEREIGNS, FOUNDER PADRE OF TOC H , WHICH RESTS IN THE ANCIENT 'ROYAL' CHURCH OF ALL HALLOWS-BY-THE-TOWER, IN THE CITY OF LONDON. 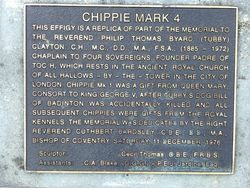 CHIPPIE MK 1 WAS A GIFT FROM QUEEN MARY, CONSORT TO KING GEORGE V, AFTER TUBBY'S DOG , BILL OF BADINTON WAS ACCIDENTALLY KILLED AND ALL SUBSEQUENT CHIPPIES WERE GIFTS FROM THE ROYAL KENNELS. THE MEMORIAL WAS DEDICATED BY THE RIGHT REVEREND CUTHBERT BARDSLEY, C.B.E., D.D., M.A., BISHOP OF COVENTRY , SATURDAY 11 DECEMBER 1976. Sculptor : Cecil Thomas, O.B.E., F.R.S.BS. Assistants : C.A. Blake (O.G.G) - P.E.J. Jardine Esq. 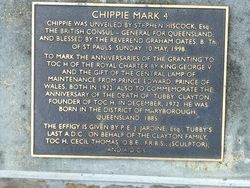 CHIPPIE WAS UNVEILED BY STEPHEN HISCOCK, Esq., THE BRITISH CONSUL-GENERAL FOR QUEENSLAND, AND BLESSED BY THE REVEREND GRAHAM OATES , B. Th., OF ST PAULS, SUNDAY, 10 MAY, 1998. TO MARK THE ANNIVERSARIES OF THE GRANTING TO TOC H OF THE ROYAL CHARTER BY KING GEORGE V AND THE GIFT OF THE CENTRAL LAMP OF MAINTENANCE FROM PRINCE EDWARD, PRINCE OF WALES, BOTH IN 1922. ALSO TO COMMEMORATE THE ANNIVERSARY OF THE DEATH OF 'TUBBY' CLAYTON, FOUNDER OF TOC H, IN DECEMBER 1972. HE WAS BORN IN THE DISTRICT OF MARYBOROUGH, QUEENSLAND, 1885. THIS EFFIGY IS GIVEN BY P.E.JARDINE, Esq., TUBBY`S LAST A.D.C. ON BEHALF OF THE CLAYTON FAMILY, TOC H, CECIL THOMAS, O.B.E., F.R.B.S. ( SCULPTOR), AND A.D.C.s.